Tired of bulky and expensive advertising display with a complicated assembly to each event you attend? 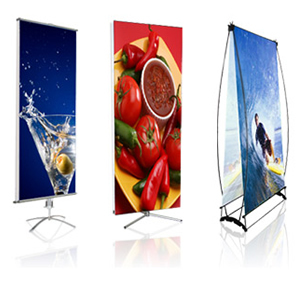 X Frame Banner Stand is a lightweight, portable and easy to set up advertising display. We provide cost effective way to display relevant company details or product information in high traffic areas, with the added advantage that the system is also portable. Made of a long lasting aluminum frame, the legs of the stand extend from a center tripod and the high quality printed banner connects to hooks on the unit for instant advertising! Every display comes with a free canvas carrying bag. Without sacrificing quality, our X-Frame Banner Stands are one of the most cost-effective display options. Ideal for a first-time trade show exhibitor with limited financial funds and space or a local fundraiser or community event, the X-Frame is the best marketing option for a cost-conscience consumer who still wants a professional display. Optional poster replacements are easy to change since the banner simply hooks onto the stand, making it perfect for an individual who needs to change the banners often. Be the center of attention and the envy of your competitors with a financially smart and user-friendly advertising display – X Frame Banner Stand! Digital Jelly has a system to suit your budget and business needs, we supply high quality banners for cost effective outdoor and indoor advertising. The print ready PDF must be at least 300dpi with a 3mm bleed if appropriate. Contact Us Today to get a Quote on Pull Up Banners.